The period covered by Arts:Search is 1896. Available soon. 8 issues published. Nos.1-2 subtitled “An illustrated Quarterly”; nos.3-8 subtitled “An Illustrated Monthly”. Edited by Arthur Symons. 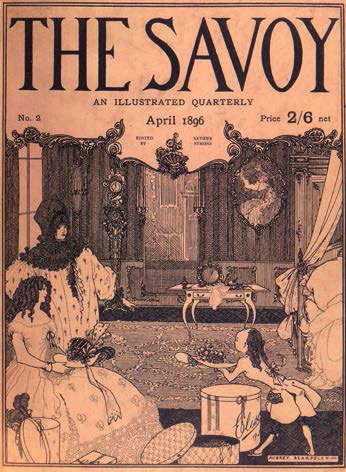 The Savoy was launched as a competitor to The Yellow Book and in content and philosophy it was very similar, with overtones of the decadent and the avant-garde. Indeed many of the contributors also wrote for The Yellow Book. These included W.B. Yeats, George Bernard Shaw, Joseph Conrad, Arthur Symons, Havelock Ellis, Ernest Dowson, Edmond Gosse, George Moore and Edward Carpenter. Illustrators of The Savoy included Audrey Beardsley (who designed the front covers), Max Beerbohm, William Rothenstein, Phil May, J. McNeil Whistler, Charles Shannon, Charles Conder, Walter Sickert, and Joseph Pennell. See: Laurel Brake. Aestheticism and Decadence: The Yellow Book (1894-7), The Chemeleon (1894), and The Savoy (1896) in The Oxford Critical and Cultural History of Modernist Magazines. Volume 1: Britain and Ireland 1880-1955, edited by Peter Brooker and Andrew Thacker. Oxford: Oxford University Press, 2009 pp.76-100 James Thorpe. English Illustration in the Nineties. London: Faber & Faber1935 pp.191-192.